CNN's Candy Crowley discusses the gains and setbacks in the U.S. war in Afghanistan. America's top military official said the U.S. review of strategy in Afghanistan and Pakistan "shows us that we are on the right track," but more progress needs to be made, particularly in the area of government and the rule of law. 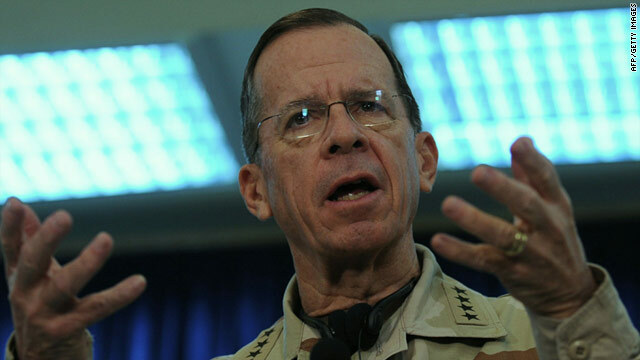 "I remain convinced that we have the right strategy, we have the right leadership and we now have the right resources in place to disrupt, dismantle and defeat al Qaeda, to reverse the momentum of the Taliban and to prevent Afghanistan from becoming a safe haven," said Adm. Mike Mullen, chairman of the Joint Chiefs of Staff. "We can take nothing for granted at this point. In fact, our review tells us that in order to fully cement the progress we've made, we must work harder with local government on the delivery of basic services and on accountability." President Barack Obama asserted Thursday that the United States is making significant progress in the nine-year war in Afghanistan, but warned that the conflict "continues to be a very difficult endeavor." We are "on track to achieve our goals" of disrupting, dismantling and defeating al Qaeda and eroding "its capacity to threaten America and our allies in the future," he said. The gains, however, are fragile. The president noted, among other things, that there has been a "successful increase" in the recruitment and training of Afghan forces due partly to the July 2011 deadline set by the administration to start withdrawing the U.S. military. From a strictly military point of view, this sentence in President Barack Obama's review of the Afghan war may be the most critical. U.S. and coalition forces can’t turn over security to Afghans if local security forces can’t hold an area — and that’s the key to U.S. forces coming home. The U.S. strategy in Afghanistan and Pakistan has shown some progress but the "challenge remains to make our gains durable and sustainable," the White House said in a new report Thursday. The United States was also still on course to bring some troops home from Afghanistan as soon as July 2011 and continue to move toward the goal of having Afghans take the lead in security in the country in 2014, the report said. While the U.S. military delivers its assessment on the strategy on the war in Afghanistan on Thursday, CNN's Nic Robertson carried out an informal review of his own. Having covered Afghanistan since the 1990s, Robertson revisited some of the places he'd reported from over the years to see what had changed. Afghans struggle on road to better future: For ordinary Afghans, insecurity, instability and lack of development have been the only real constants. In Herat, Robertson found a governor frustrated with his government in trying to move projects forward and a new road project completed near a school that leaves the U.S. with an image Catch-22. Obama's Afghan review: As the war drags on, just a formality? The game has changed in Afghanistan since President Obama last year laid out his plan to tame the Taliban and start withdrawing troops. While U.S. military officials boast of significant gains in the militants' southern strongholds in recent months thanks in large part to the President's troop surge, they caution that it won't be possible to fully gauge the impact until fighting picks up again in the spring. And even in the best-case scenario, it will still take at least four more years to complete a full handover to Afghan security forces. So as the Obama Administration this week undertakes the review of Afghan strategy promised 12 months ago, the White House — in deference to the military's view that more time is needed — has signaled that no major changes are under consideration. This week's assessment of the state of the war in Afghanistan has become little more than a formality. "[The review] is definitely not as significant as it was, which is good for the Department of Defense," says a senior U.S. officer serving in Afghanistan. The writing has been on the wall for months. When the President told West Point cadets last December that he was deploying 30,000 extra troops to the conflict, he made clear that he believed he was raising the force level in order to create conditions to hasten U.S. withdrawal. But shortly after the speech, Administration and military officials began to downplay the July 2011 date Obama had named for the beginning of that drawdown. A review of the war in Afghanistan coming out this week won't change current plans to start withdrawing some U.S. troops in July, White House press secretary Robert Gibbs indicated Tuesday. "The view is that our transition can begin - the conditions-based transition of our added forces - in July 2011," Gibbs said of the planned withdrawal of some of the additional forces ordered to Afghanistan a year ago by President Barack Obama. Gibbs spoke to reporters after a nearly two-hour meeting involving Obama and all of his senior Cabinet and military advisers to go over the upcoming review. Obama will make a public statement about the review on Thursday, Gibbs said. 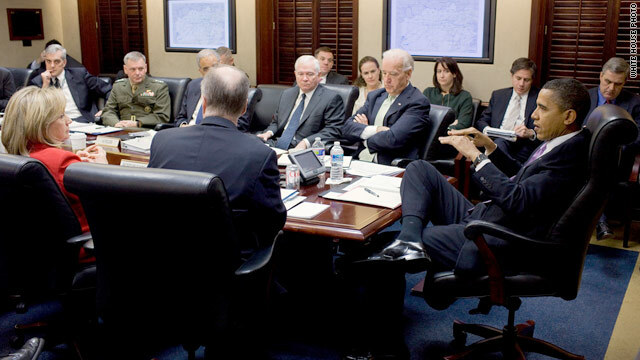 President Barack Obama meets the national security team during a monthly meeting on Afghanistan and Pakistan in the Situation Room of the White House. A long-awaited U.S. military analysis of the war in Afghanistan is expected later this week, a year after President Obama ordered additional U.S. troops to the country as part of a strategy that could bring some forces home as soon as July 2011. Officials have said the goal is to end combat operations in Afghanistan in 2014.